Saplunara is a bay and small place located on the southeastern tip of Mljet that is famous for its sandy beach Saplunara (meaning tiny sand in Latin). There are two sandy beaches in Saplunara: Large Saplunara and Small Saplunara. Large Saplunara is located in the very centre of the bay and village. Due to its location the beach gets much more crowded than Small Saplunara, which is located a bit further along the bay. Beach restaurant and cafe is opened May to October. This is another sandy beach on Mljet, located about half and hour walk from Saplunara. 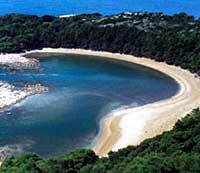 It is almost 1/2 mile long beach, secluded among sharp stones of Mljet southern shores. This hidden bay and beach is surrounded by pine trees and faces South and looks like a lagoon. The entrance from the sea to Blace beach is very narrow (only 8m wide) so the seawater inside the lagoon gets very very warm and is possible to swim here even at the times when sea water outside is still cold and not suitable for swimming. Due to its isolated location, Blace Beach and Bay is popular among naturist and nudists too. The area of Large Lake ( Veliko Jezero) on Mljet is popular for swimming and sunbathing among visitors on day trips and excursions to National Park Mljet that comes at Mljet daily from Korcula or Dubrovnik. If you come here on the day trip, you will visit small island Melita and it’s 12th century monastery and at lunch brake you will have opportunity to go for quick swim here at Large Lake.